As a millennial, I dream big and everything I do is intentional and serves a purpose. I wasn’t always this way. It took years of professional success, financial distress and low personal satisfaction to get to where I am today. I am more mindful of the decisions I make and understand the implications my financial knowledge has had in my ability to live my dream lifestyle. I am still on a quest for complete financial freedom and each and every day with the decisions I make I continue to lift the burden of the past mistakes. This summer I went on a road trip called The Road to Financial Wellness. We met with thousands of people in the 30-day road trip and had deep meaningful conversations with hundreds of people from every generation. The conversations may have taken place in 30 different locations around the country but the conversations were very similar. We are a purposeful bunch and we care a lot about social impact. We also understand the importance of financial freedom in order to do things of significant importance. However, many millennials are straddled with student loan debt, low wages compared to cost of living in the cities they reside, and difficulty in finding affordable housing. Older generations face concerns of their own with credit card debt, stagnant income and less than perfect credit with the added stress of retirement age approaching. Many individuals in every generation is seeking financial freedom but the commonality across generations is the lack of awareness regarding their relationship with money. Ultimately, a lack of understanding their money mindset that’s perpetuating questionable financial decisions preventing them from achieving financial freedom. The answer varies. Some define financial freedom as having no debt or a million dollars in retirement savings. While others define financial freedom as the ability to do anything without financial constraints. I define financial freedom as the ability to live a lifestyle devoid of the anxiety over having too little or too much. Financial freedom is the state in which I control money and I am not controlled by it. I don’t fear the scarcity of it or the temptations of abundance. 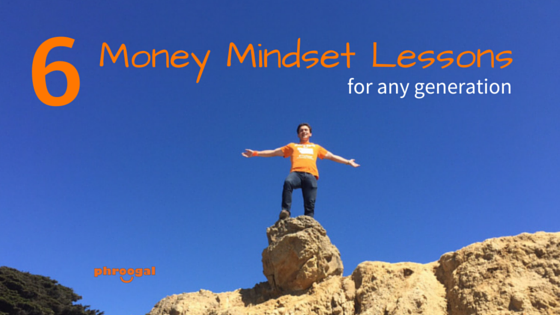 Financial freedom means money is a tool not an end goal. On the road trip, I focused the conversations on mindset and the relationship we have with money that hinder or help us achieve financial wellbeing. Define the lifestyle you want to live. We’re often focused on financial goals but as millennials we need to understand how those financial goals contribute to the lifestyle. Many did not want to commit to a monthly car payment or plant themselves with a mortgage. It’s important to understand the life you want to live and then identify the financial goals that support that lifestyle. Money can by happiness. One thing I’ve learned from the wealthy is that money does buy happiness and those who understand that make better financial decisions. Knowing that money can buy happiness will make it easier to choose long-term happiness over short-term satisfaction. Money provides for the needs that allow you to use the rest of your time on creating. Pay yourself first and have a purposeful savings strategy. Make sure you identify how you plan to spend your money today and how you’ll spend it in retirement. Prioritize savings so you can retire sooner rather than later. The more money you have saved towards retirement the sooner you’ll be able to say goodbye to your job. Watch out for lifestyle inflation. We might tell ourselves that we’ll wait to save or contribute to our company’s 401K after the merit increase or promotion. There will never be a better time to start saving money. Lifestyle inflation causes us to spend at the same rate making $75,000 as we did making $30,000. Don’t keep up with the joneses. Spending your hard earned cash to keep up with someone else’s lifestyle will lead to financial disaster. Be mindful that when you’re keeping up with the joneses your money is spent to live another person’s dreams not yours. The purchase of things and experiences are the exact same thing. Whether you decide to travel around the world or buy that luxury car, spend only on things and experiences that matter to you. For most of us, experiences trumps things but I can tell you that driving my BMW on the winding roads of Napa Valley was definitely an experience. Understanding what you truly value will make you spend on things that add value in your life.